We quite often think of our situation here in terms of what things would be like in Edmonton, or even Ontario, six months off. Like today, for example, where it is the middle of winter in Wagga. In Edmonton terms, this would be like the middle of January – given that it is a Saturday, we might have gone to the market (where there wouldn’t be much but root vegetables and meat), then hunkered down in the basement with the fireplace going because it would be in the minus double digits probably. Edmonton markets sell hardy, starch veggies in the winter, while people here give away seedlings like this one, found at Wagga’s winter market. 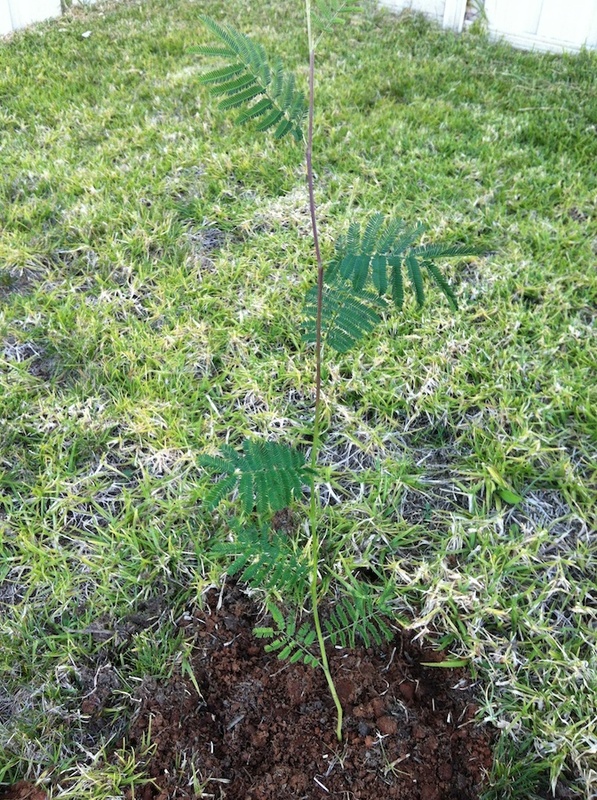 It’s a wattle, by the way. What do Waggans do in winter? Well, they whinge about the cold and rug up…put on a blanket, that is. At least in the evening when it gets cold. But during the day, they do things that Canadians would do in the spring, summer, or autumn because it usually isn’t really cold. So what did we do today? Well, Lisa got up and did work and laundry because she is headed off to Melbourne for the week. By afternoon she was even spending her first bit of time on the patio with the laptop! Yep, this is winter. Dan got up and went to the butcher, the baker and the candlestick maker (we don’t like candles – the cats would burn our house down), the fruit and veggie shop, and the hardware store to buy a composter. Then he was going to go to footy, but the game that others were seeing started at an inconvenient time…right as we were having lunch. And it was such a beautiful day that he wanted to get working on the yard. Yes, mid-winter is gardening time! We’re really looking forward to this camellia getting big. They are in bloom right now all over Wagga and absolutely beautiful. After assembling the composter, he did a bit of planting. He had put in a few little flowers and some strawberries earlier in the week, in an effort to prevent the rock wall at the back of the house from erosion. But what happened today was on a bigger scale. Last week at the farmers market, there was a local eco group giving away native plants – tube stock, or what we might think of as seedlings. We took a wattle, a bottlebrush, and some other things we forget what they are (a dianella, maybe a myrtle, and maybe a maleleuca. Should have paid closer attention…). Right now they are tiny, but will grow quickly. 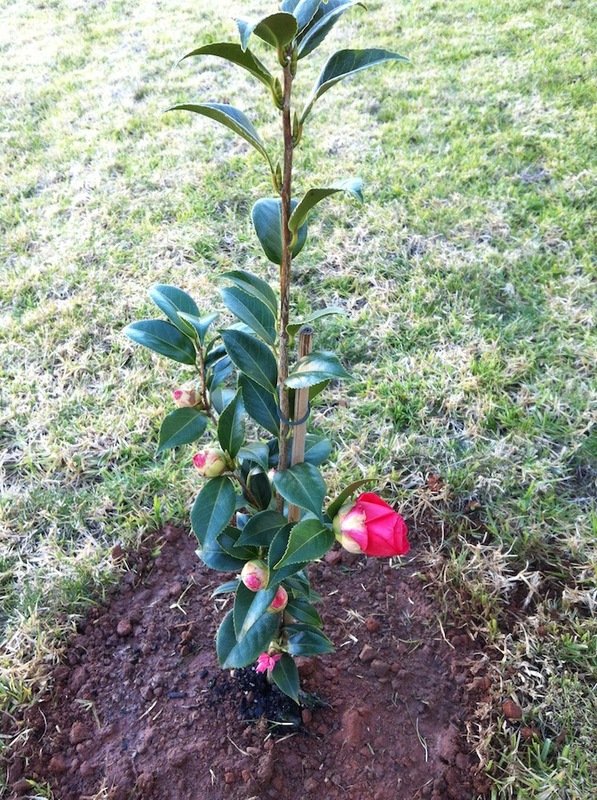 Those got planted in the morning, along with a camellia that a friend gave us last weekend. The little citrus trees at Bunnings fit perfectly into the boot of the KIA! Then, in the afternoon, rather than going to see the footy or taking advantage of the 16 degree weather to go cycling, we went back to Bunnings (above-mentioned Home Depot-like hardware store) and picked up a few more interesting things to plant. Along the south side of the house, we have a bed that doesn’t get a lot of sun or get seen often so we figured that would be a perfect place for some herbs. Those aren’t planted yet, but will be on Sunday. 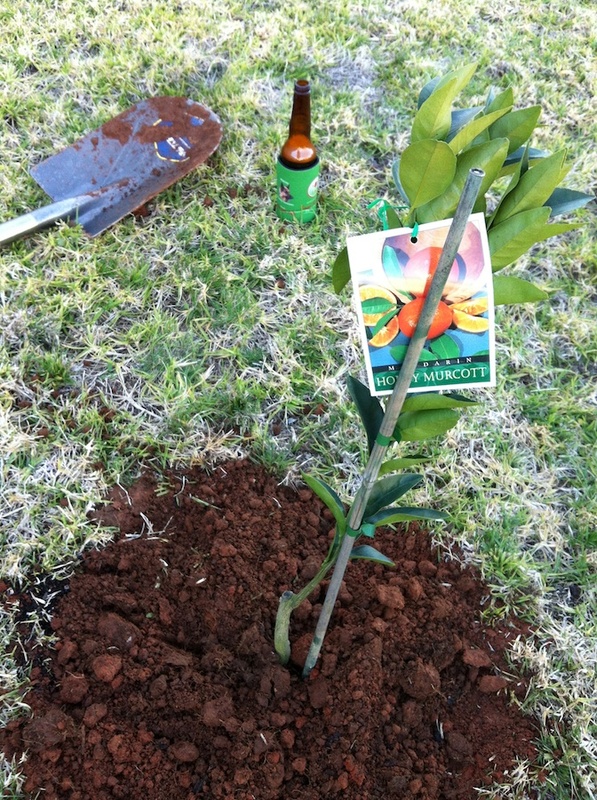 What sidetracked the gardener from the herbs was creating a small citrus grove! 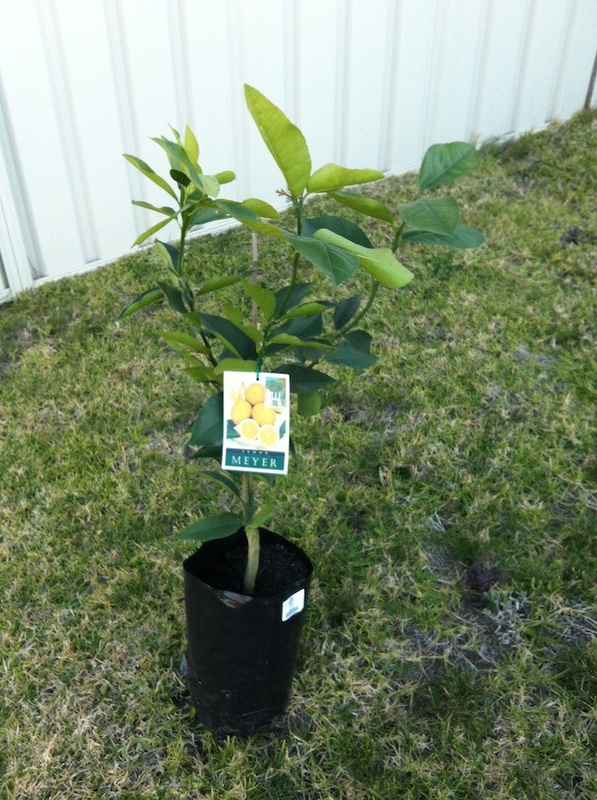 We are now the proud owners of a meyer lemon tree, and Australian lime, and a Honey Murcott mandarin. We bought sort of dwarf-like citrus trees, not wanting them to take over too much of the yard. One third of our little citrus grove! Maybe we’ll add a grapefruit tree and an apricot tree some day. These will end up maturing at about 4 metres high. We had hoped to buy bare root stock, but for some reason there weren’t any…there were last weekend, but maybe all those other people at Bunnings (the place was packed today!) beat us to them. But these ones will probably be fine, and they have leaves on them now even… And hopefully next year, we will have our own fruit. We still have a lot of planning and planting to do, and not sure how fast we will get to it. We have some plants that we brought from the other house – kangaroo paws that lived in pots – that are going to go into a bed. Those pots will then be used for blueberries. Yes, we’re going to try to grow a few blueberries, even though we reckon we’ll have to fight the magpies for them. And then at some point we’re going to figure out where to put in a veggie patch and see what it is like to have a 12-month growing season. It’s a whole different world from when we used to plant our garden in Edmonton, watch it slowly mature and then freeze before we could harvest anything. 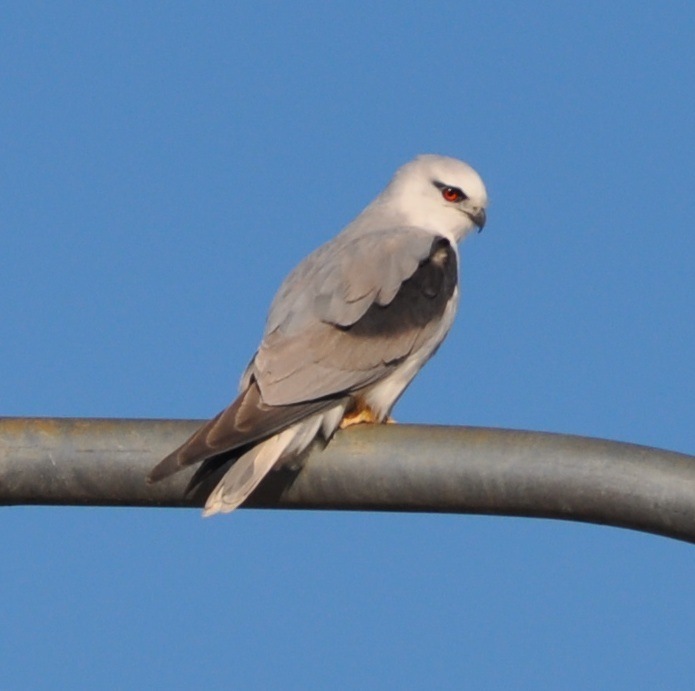 Gratuitous animal photo…this black shouldered kite kept distracting Dan as he gardened by just sitting on the light pole in front of our house, looking for mice. Those bright red eyes are very mesmerizing…and maybe good for finding rodents. 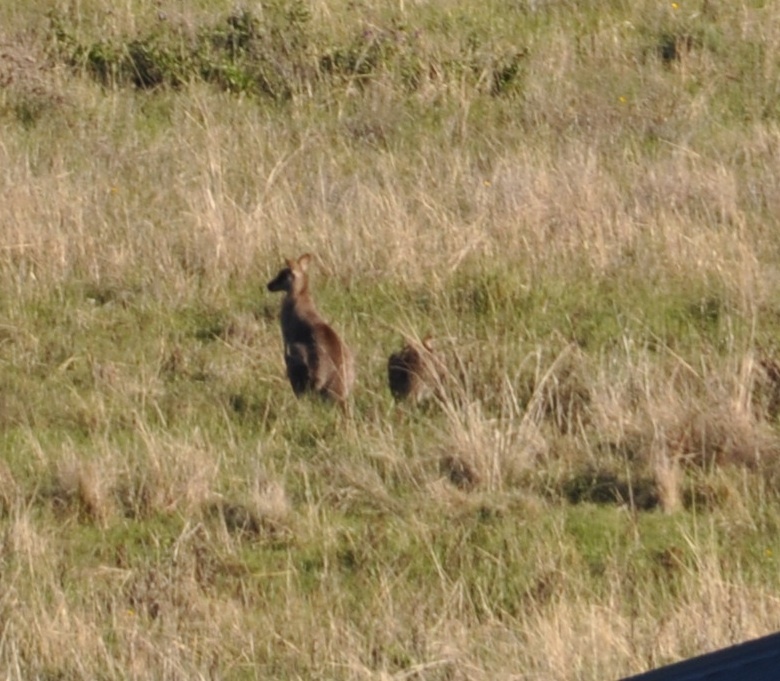 Another distraction (and useless critter picture) – the view over our south fence while Dan gardened…or more accurately part of the view, there were about 20 roos there. And one lone one in the park across the road from us… how do Aussies get any work done with all these cool animals to watch? This entry was posted in agriculture, Australia, citrus, cold, fruit, gardening, wagga, weather, winter. Bookmark the permalink.